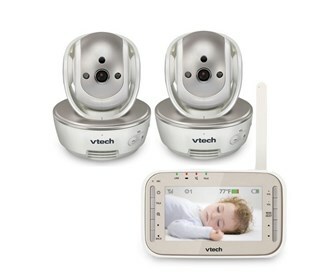 The VTech VM343 + (1) VM305 is a safe and sound full color video and audio baby monitor which assures that the child is sleeping peacefully and also enable parents to monitor and see baby anywhere in the home. The 10 infrared LEDs automatically detect dim light, providing clear video even in dark rooms. The Talk-back intercom helps to reach your voice to your infant from any room with the built-in intercom on the portable parent unit. The VTech VM343 + (1) VM305 is equipped with 4.3" LCD color display that shows sound and video monitoring. This digital video monitor also has an impressive range of upto 1000 feet with an out of range warning. The camera pans up to 270 degrees side-to-side and tilts as many as 120 degrees up and down. Wireless Range: Up to 1000 Ft. The VTech VM343 + (1) VM305 has many exciting features for users of all types. You can extend the lifetime of your VTech VM343 + (1) VM305 with the purchase of a FactoryOutletStore Factory Protection Plan. See the VTech VM343 + (1) VM305 gallery images above for more product views. The VTech VM343 + (1) VM305 is sold as a Brand New Unopened Item.